So all of you listening to this podcast have probably got an intermediate or advanced level of English – have you ever had the experience of trying to describe an everyday situation in English and struggling to find the right words to do it? So Adam starts off by saying he thinks the man wasn’t wearing a seat belt. So far, so good. His next guess is that the car started to barrel roll – so what does that mean? 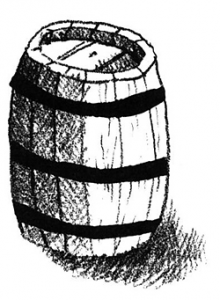 Well, picture a barrel and imagine the barrel rolling down a mountain. That’s what Carolla thinks happened with the car: it barrel rolled, or rolled like a barrel down a hill or a mountain. So I hope you remember this from school – when there’s something rolling like that, or spinning on it axis, centrifugal force is generated. You know that machine that dries clothes that have just been washed – a clothes or tumble drier? It’s able to dry clothes because of centrifugal force. So Adam says that, because of centrifugal force generated as the car barrel rolled, the door flew open – a bit later on he uses the expression flung open, which basically means the same thing. Flung is the past tense of fling. So centrifugal force pushed the door open, or flung that door open; the door flew open or flung open because there was something forcing it to open. So with the car barrel rolling down a hill, I guess, and the door flinging – or moving from one side to the other – the driver was launched from the car. The driver was launched, or ejected from the car. Then Adam finishes by saying that if the driver had had a seat belt on, he wouldn’t have been launched from the car that barrel rolled as the door flung open. So there you go – good vocabulary to describe a very specific situation. Awful accident, by the way! Have you ever been on a car that came barrel rolling down a hill? Let us know in the comments, and talk to you next time. Na narrativa, acredito que ele não pronuncia o “have” no trecho “he wouldn’t have been launched from the car”. Correto? Ele provavelmente “come” o have ou pronuncia mto rápido – seria isso? Although I’ve finished an English course in a private school here in my city I know there are still tons of things to learn, and in this podcast I just learned the meaning of “barrel rolll” and “fling”. Please don’t stop of being and awesome person. Fantastic. I really liked this episode – I’ll be on the lookout for more interesting bits to add to the podcast :-) Glad to know you enjoyed it! Hey Ana! I love when you bring us something new or something specific and when it sounds different!!! This podcast is awesome!! However, I confess I have never gone to a car accident before… thank God!! Like you, I’ve never been in a bad car accident..